The Tangle Lakes area contains some of the earliest and most continuous evidence of human occupation in North America, extending back more than 10,000 years. At least four cultures occupied the area: the Denali Complex from 10,500 to 7,000 years ago; the Northern Archaic Tradition from 7,000 to 1,000 years ago; the Late Prehistoric Period from 1,000 years ago to 1770, and the current Athapaskan Tradition. Over 400 archaeological sites dot the area. 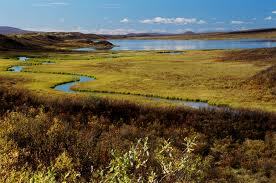 About 225,000 acres are officially designated as the BLM’s Tangle Lakes Archaeological District, listed on the National Register of Historic Places. The District is wide open to exploring and recreation. But remember the area is covered by the Archaeological Resources Protection Act, which prohibits collecting or damaging any artifacts or sites. The Susitna River, 80 miles from Paxson, was the site of gold fever around the turn of the century. A company of prospectors first explored the river in 1897. But swarms of mosquitoes attacked the miners, swelling their eyes and nearly blinding them. These tribulations and an exhausted food supply forced them to abandon their search, but legends of gold in the area persisted. Several years later, the discovery of the Valdez Creek gold field sparked a minor rush. Over the next decade, $300,000 worth of the metal was extracted, and the discovery of a mother lode vein in 1925 sparked another flurry of activity. An original log cabin of the Valdez Creek Gold Camp remains standing just west of the Susitna River, with a viewpoint overlooking the mine across the river.